There’s a limit to how bad any movie starring Bill Murray can be, right? 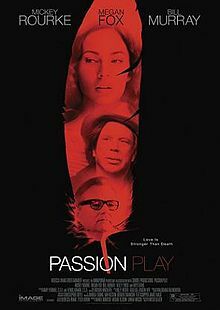 Well Passion Play tests that limit, then goes way beyond it. Meanwhile, Elliott reveals his sexual secret identity, Dan gets to the bottom of ding-dong-gate, and Stuart is baffled as to why we put him through this. AUDIO NOTE: Apologies for the slightly worse sound this episode. We’re actually using new, higher-quality mics, but it turns out that they’re too sensitive to be used in a non-soundproof room without picking up all kinds of unwanted background noise. Next time we should be back to the old set-up. 0:34 – 35:10 – At least Passion Play is the first Megan Fox movie that’s not bad BECAUSE of Megan Fox. That’s gotta be worth something, right? 55:06 – 59:24 – The sad bastards recommend. 59:25 – 1:00:27 – Goodbyes, theme, and outtakes. Capitalizing on America’s love of bloody feathers. That would, of course, be Pygar as the guy in Barbarella with the wings. Durand Durand is the scientist she is searching for. Looks like someone knows a SUSPICIOUS amount about Barbarella, “wildride.” Or should I say… JANE FONDA! No, no — You should definitely say “wildride”. Otherwise, how would I know you’re talking to me instead of Jane Fonda. It’s really the underlying principle of direct address. Speaking as a big RZA fan myself, I wish there were an actor whose mama had named him “RZA Fans”. Unfortunately, I don’t think that is how Rhys Ifans’s’s name is pronounced. This Welsh person (https://www.youtube.com/watch?v=_w_W2qBJk-c) says Reese EE-vans (Reese like Reese Witherspoon and EE-vans like “Evans” with a long E). I’ve heard an English interviewer say it more like Reese Iffans, so maybe that’s more common for those us who are not Welsh, I’m not sure.